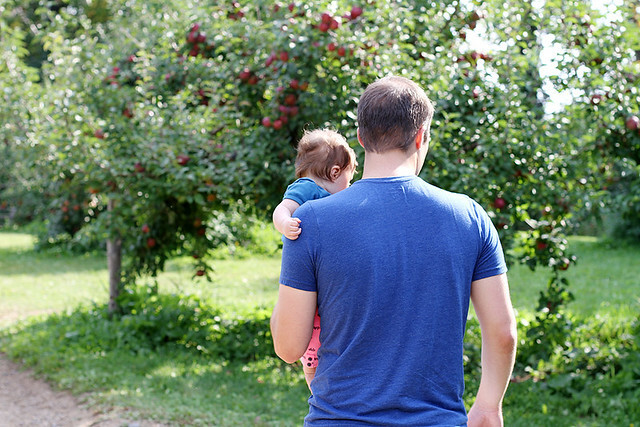 It’s a funny thing, taking a four and a half-month-old to an apple orchard — because all she can really do is pick leaves off the apple trees and sit on pumpkins — but last weekend, we decided to do it anyway. Because it’s fall and it was beautifully warm and apple picking is what you do is what I told myself when I came home with 10 pounds of apples. Ahem. Rest assured, if you are an apple hoarder like I am, I have an om-nom-nommy apple recipe roundup at the bottom of this post for you to use them up in — pies and breads and muffins and pizzas, oh my. But I digress. 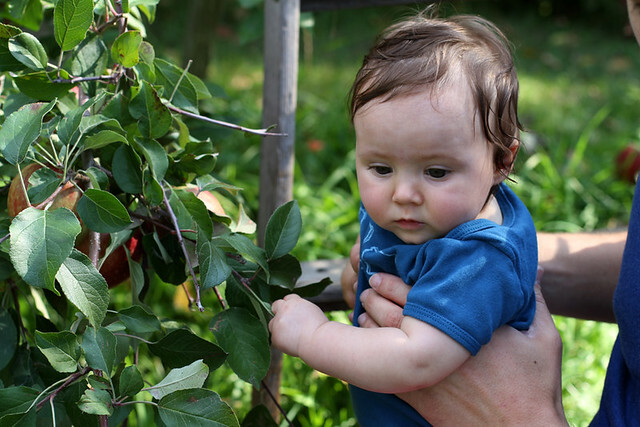 Because I’m first here to bombard you with a gazillion photos of apples, my baby girl, my baby girl with some apples, apples on trees in the backgrounds of photos of my baby girl — you get it. 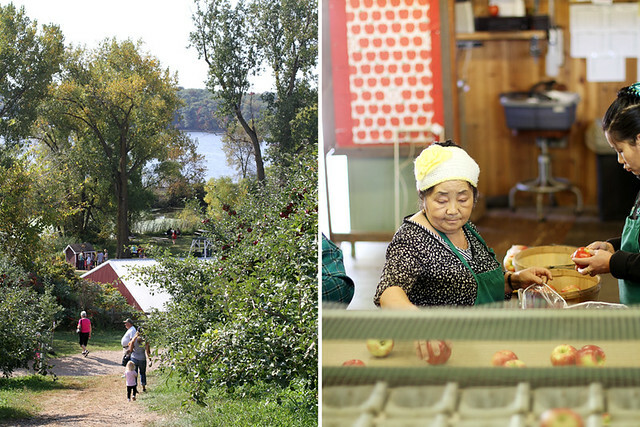 We went with my mother-in-law to Pine Tree Apple Orchard in White Bear Lake, Minn. — locals, have you been? I won’t lie, I was super disappointed that they don’t let you actually pick apples off the trees. Never in my 27 years of apple-orcharding have I not been allowed to pick the apples myself. That being said, the apples we did purchase at the orchard store were much higher quality than anything I probably would have picked off the tree and it did keep me from accidentally coming home with 30 pounds of apples, like I did the last time I went to an apple orchard. 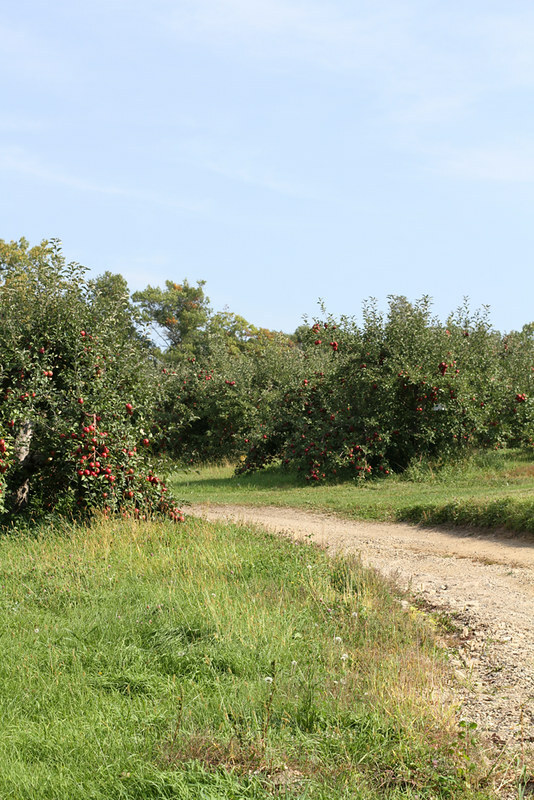 It also meant the most popular varieties, like Honeycrisp and McIntosh, were still available. 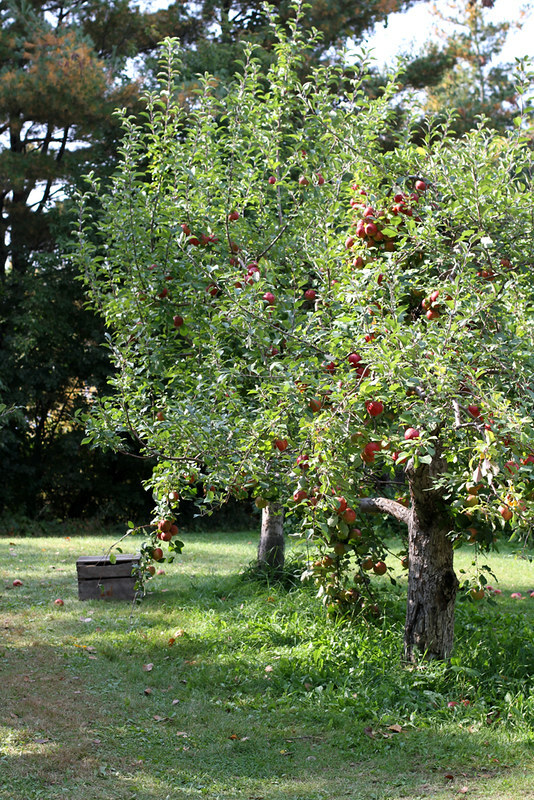 The orchard itself was also in pristine condition, too, because it wasn’t a free-for-all of apple picking. So there were actually apples on the trees! It was so hard to not pick one off like a rebel and bite right into it. But I behaved. Instead, I let my daughter pull the leaves off some of the trees that were within her reach and kept preventing her from putting them in her mouth. So I’ll be collecting that Mom of the Year trophy any day now. 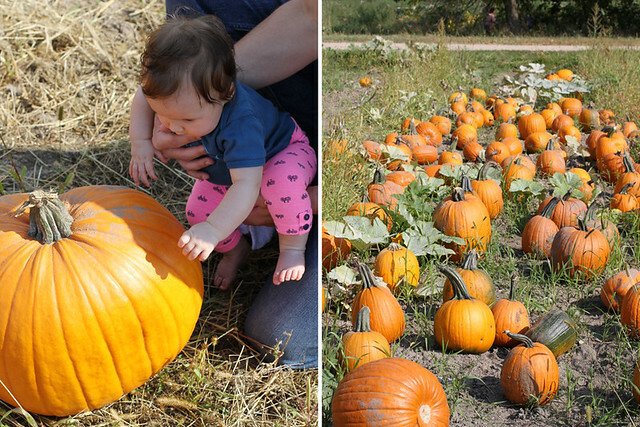 There were wagon rides and a corn maze and a pumpkin patch, all of which I’m really excited to do next year — I mean, have AVERY do next year. And the orchard store had oodles and goobles (goobles? I dunno) of apple-y baked goods, from apple pies and apple bread to apple turnovers and apple donuts. Sadly, many of these baked goods were made with processed ingredients and that’s not really my jam when it comes to baked goods from an apple orchard (which, yes, is a category of baked goods to me), but we did come away with a jug of pure apple cider that was deeeelish and it took everything in my power to not down approximately threeve caramel apples while we were there — but we were on our way out to eat and I didn’t want to spoil my lunch, wah wahhh (I was trying to keep up my Mom of the Year image, obviously). All in all, the trip was a success and I’m very glad we went. Avery is glad, too, because of all the yummy apple pie she got to eat baked with the apples I came home with — KIDDING. About Avery eating pie, that is. True story about the baking of one, though. On that note, happy weekend, my friends. I hope it is filled with cozy sweaters and cool weather and warm drinks and maybe even some apple orcharding, if you haven’t done so yet. I still remember that skillet muffin bread from last year. I’m going apple picking this weekend and think I might need to make it again. So good! SO MUCH ADORABLE all around. Also, I want all the apple recipes IN MAH BELLY. Cute pics!!! Making good memories to share with her later. Pretty sure you win the award for cutest family EVER. Looks like a fun trip to the orchard! 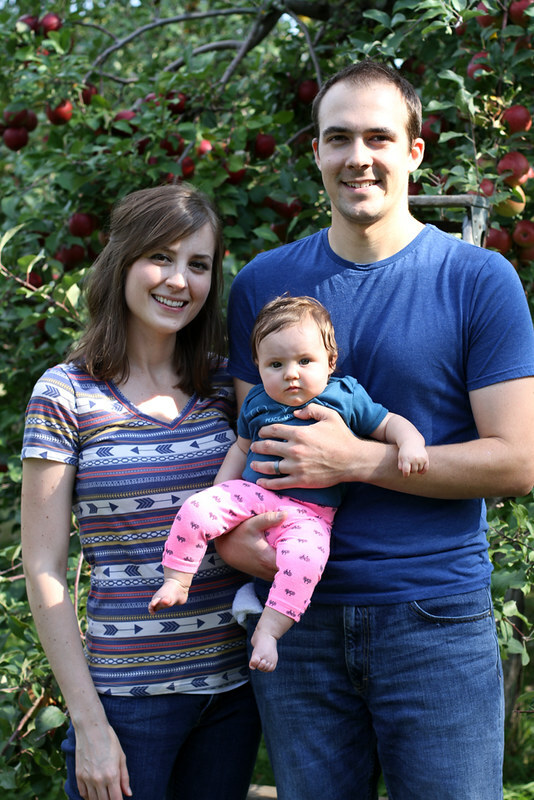 I love Aamodt’s but this year we went to Deardorff Apple Orchard out in Waconia which was fantastic and also gets double points because it is also a winery. Wine AND apples?! Yes, please. This is so adorable. I can’t wait to do this! AWWWW!!! She is so cute and that hair is fab! I would love to go apple picking one day. Also, no judgment for wanting to ride the wagon next year. I’d do the same! these photos are the best! love your little pumpkin. and yes, you’ll definitely be getting that Mom of the Year trophy. Taylor — Ummmm I really regret not going to there instead. I might have to make a second apple orchard trip. And wine trip, obvi. 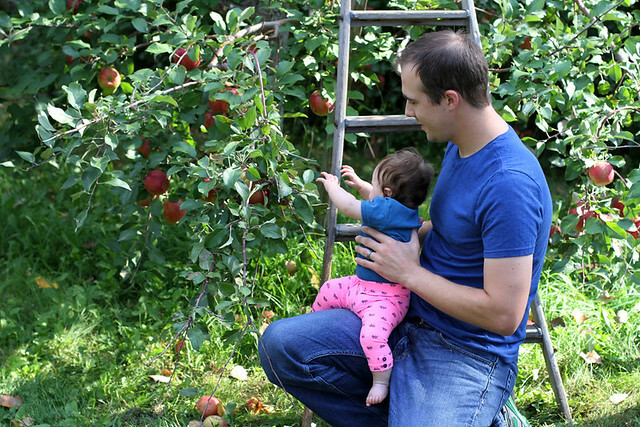 WHY IS APPLE PICKING NOT A THING IN LOUISIANA? What a CUTIE! 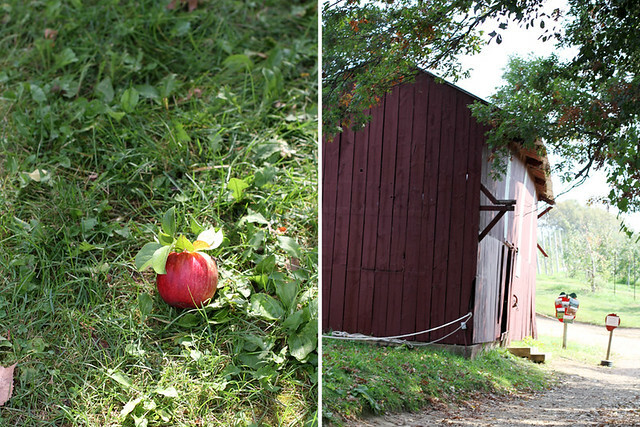 Love the apple orchard, especially when it involves everything fall! oh my gosh, she is soo cute! sounds like you guys had a blast. i’m surprised they had so many processed baked goods! that’s a bummer! Such adorable pics!! We just picked 20 lbs of apples and I’ve been baking up a storm!! I’ll be checking out some of these recipe, thanks! I am immensely jealous…why don’t they grow apples in Texas?! And Avery is THA CUTEST!! Tiny baby feet, I just can’t get enough of them! Can’t wait to see what you make with your loot! She is the cutest!! I’m hoping to make a trip to the local orchard soon. Too cute!!! You guys are adorable! Avery is totally the cutest! 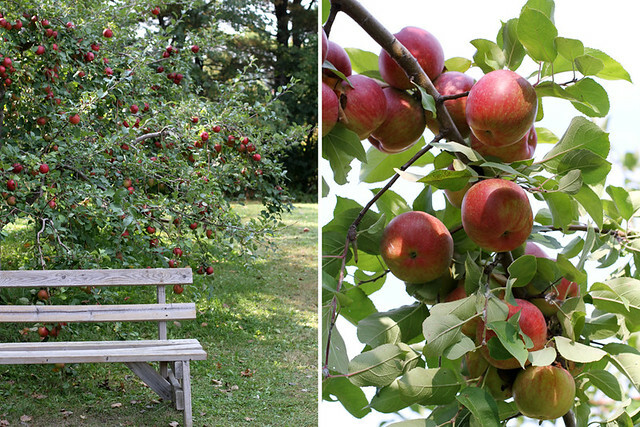 Looks like such a fun day + apple picking (and baking!) is totally the best part of fall! Maaaaah! What a beautiful trip with beautiful photos and beautiful apple recipes to come! Your lil’ darlin looks so healthy and gorgeous!! You’re making me want to go apple picking (slash, apple grocery shopping, since the orchards in my area don’t allow you to pick apples, either…booo!)! Have a great weekend, my dear! This made me smile so much. Gosh, she’s a cutie! And the apples are pretty cool too. I just noticed she’s actually gripping your husband’s shirt in the photo where he’s holding her out. So stinkin adorable! Courtney — Lol! Isn’t that hilarious? She does that to us all the time. 🙂 Thanks, girl! Mega adorable. PS. How fabulous do you look?! Wonderful photos. There is something sooooo comforting and old world about apple trees and pumpkins——-and darling babies. Goodness she is adorable!!! Oh my gosh she is soooo cute! 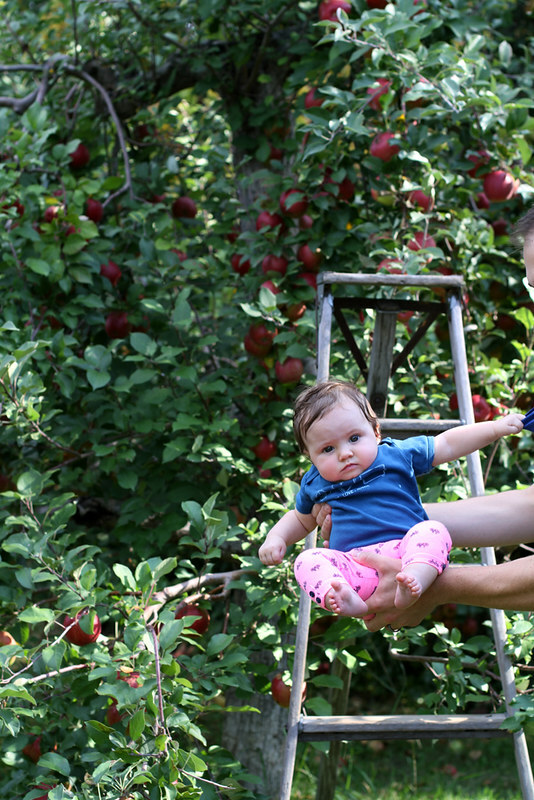 I was going to write a comment about apple picking or something and all the words left my brain after the photos of her.